New dialogue. New convenient setting. Tweak scripts. Bug fix. At least, followers will be better than vanilla. Added "Let's talk about your default armor and weapon.". This can add and remove the default armor and weapon in the conversation (except Dogmeat, RL3). Optional Sydney also will be updated. Corresponding to FWE's followers combat style issue. Thanks to y2alex. Restore the FWE support version. Again: Update for UUF3P "Smoking NPC Bug Fix". Added three choices to ignore combat setting. "Until player's health falls below 33% (default) or 50% or 75%". The < Followers Marker > and < Followers Teleporter > has been set to quest item. Thanks to Degrelescence. Added FOMod install script. I learned a lot about FOMod from Thinking Skeever blog (http://thinkingskeever.hatenablog.com/). Thanks. Added Wrye Bash BaIn Wizard. Added new home marker setting. Added Sydney Marker quest. it is same feature as Followers Marker quest, but it can set show/hide in the conversation. Corresponding to new file of Blackened FWE - EVE - Project Beauty. Corresponding to new file of Blackened RH_Ironsights - FWE - EVE. 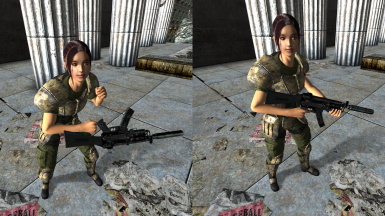 Corresponding to weapon and ammunition mismatch if using Blackened FWE + each plugins. Some tweaks and script fixes. Sydney can be hired at the Ninth Circle after completing the "Stealing Independence" quest. Removed "Backpack ON and Equip" features of backpack option. Fix again: Weapon and ammunition mismatch will be fixed if you use the FWE or Blackened. Weapon and ammunition mismatch will be fixed if you use the FWE or Blackened. About home marker feature and dlc. In the vanilla, follower will return to their original location when player start the dlc quest. At that time, they will not return to their new home marker even if you set new home marker. In short, this feature is the same as vanilla. In fact, they will return to the location indicated in the message. Fixed Idle Animation (LooseSmokingStanding). Jericho will be non smoking during sneaking (it may take a little time, he seems to love smoking). With this fix, FWE support version was no longer needed. Added new home marker option. Synchronisation update for UPDATED Unofficial Fallout 3 Patch 1.7. *I rely on machine translation because I am not good at english. Most features will set in the conversation with followers. - You can order to "relax here" followers (except Dogmeat, RL3). - You can choose essential setting on/off in the conversation. 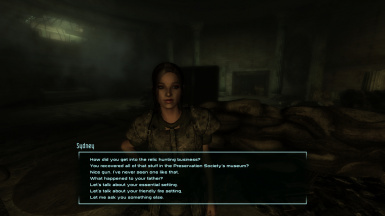 - You can choose ignore combat setting on/off in the conversation. - You can choose ignore friendly fire setting on/off in the conversation. - You can choose weapon drawn setting on/off in the conversation. - You can set on/off new home marker to current player position in the conversation. - You can add and remove the default armor and weapon in the conversation (except Dogmeat, RL3). - Add < Followers Teleporter >. This new item will teleport followers near the player. When they do not follow the player, this item is useful. - Add < Followers Marker >. This new item will display followers position on the map. You can track follower that you have hired once. If turn on the ignore combat, followers will not participate in combat. They will sneak state until the end of combat (except creature companion). However, ignore combat will excluded in the following situations: player's health below 33% (default) or 50% or 75%, wait state, relax state, not hired. For example, if player's health falls below 33% during the combat, followers start combat. Weapon drawn is except grenade and mine. and considering the time of switching weapons by player. If player and followers are weapon drawn state, and order "wait here" to followers. They guard on the spot in weapon drawn state. Followers will be synchronized with the player actions at close range. If turn on the backpack, You can order to "Open your backpack" followers (except creature companion). If turn off the backpack, "Open your backpack" dialogue is removed but items will not disappear. If follower dies, items will be transferred to their inventory. Home marker can be set only one place in each follower. If you set a new home marker, you can choose new home ("go to new home and relax") or vanilla home (default dialog) in the conversation when you dismiss follower. In the vanilla, follower will return to their original location when player start the dlc quest. At that time, they will not return to their new home marker even if you set new home marker. In short, this feature is the same as vanilla. In fact, they will return to the location indicated in the message. Companion's default weapons ammunition is unlimited. However if you need, it is removable (can add and remove) in the conversation. Melee weapon and armor is also same. These might be "playable", but I was to be able to control from the conversation. When player talk to followers during sneaking, followers also continue to sneaking (not stand up). Fixed Idle Animation (LooseSmokingStanding). Jericho will be non smoking during sneaking (it may take a little time, he seems to love smoking). When player is sleeping, followers should also sleeping. So that means they are recovered. If followers are injured, you can be treated by giving a stimpak. Ignore Traps: Followers will no longer trigger traps (Laser Tripwire, Tripwire, Pressure Plate, Bear Trap) except Mines. Unlimited: No limit to hire of companion. Karma condition and followers count are abolished. Sydney: Sydney can be hired at the Ninth Circle after completing the "Stealing Independence" quest. 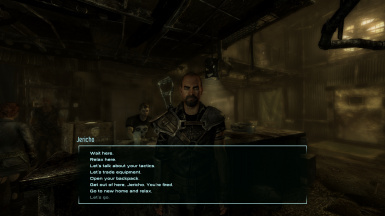 Incompatible with FO3 Wanderers Edition - Followers Enhanced (Optional Modules). FO3 Better Followers - Sydney (Optional files) are incompatible with Sydney Follower. 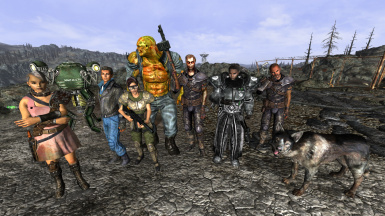 Load after the FWE - FO3 Wanderers Edition (FWE) plugins or Arwen_Realism_Tweaks (ART) plugins. 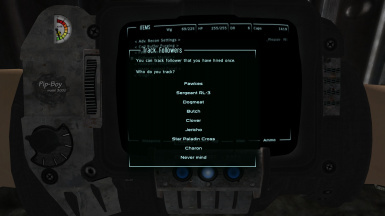 Load after the Blackened FWE plugins if you using FO3 Better Followers - Sydney (Optional files). If you have not installed the FWE and ART, Load later as much as possible.